I'm Here. I'm Queer. What the Hell do I read? 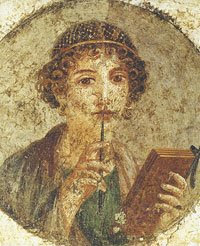 : Sappho celebrates LOVE - LESBIAN LOVE - and we celebrate with her for National Poetry Month! Sappho celebrates LOVE - LESBIAN LOVE - and we celebrate with her for National Poetry Month! the most beautiful thing on the dark earth. But I say it is whatever one loves. and their infantry in full display of arms. "Valuing personal love above heroic glory separates Sappho not only from the epic tradition but from her only important lyric predecessor, Archilochus. The first woman poet is the first poet to give love this central place. Though she takes the figure of Helen from the epic tradition, she refuses to castigate her as the woman who betrayed her husband. Rather, she honors her as a woman strong enough to be led by love, by her own feeling." And I believe in this day it is being true to ourselves and our queer love that is OUR heroic glory. For me, this poem is all about honoring our loves. Sappho, and her place as the "Tenth Muse" as Plato called her, is perhaps so famous due to this shift she pioneered, of daring to put love (including her own queer love) above all the other wonders of the world. Truly a poem, and a woman, to celebrate! I agree that the most beautiful thing on earth is what one loves. Thanks for sharing, I had not read Sappho before!